She seems very pleased with herself, having just propelled her party further towards electoral defeat. This should be another nail in Theresa May’s prime ministerial coffin – even though Andrew Marr gave her the usual easy ride in his interview. Note that her inability to answer a simple question – why nurses are being forced to use foodbanks – has also provoked derision after the BBC posted the interview on YouTube. The interview came in for more detailed discussion on Facebook, where Martin Odoni commented: “What’s so pathetic is that Marr, being a BBC (Biased Broadcasting Conservative) presenter, helpfully gave her a starting heads-up not to do it, and she still went onto autopilot within seconds. “She doesn’t even have the power of thought. I don’t just mean that she can never think outside the box, I mean she can’t think outside the list of pre-rehearsed clichés stored inside a box that otherwise contains nothing but empty air. There are only two conclusions to be reached, here. The first is, it is possible that Mrs May is not a human being at all, and should be subjected to the Turing Test, to determine whether or not she is a robot. The only sane response to any appeal for you to vote ‘Conservative’ is ridicule. It took her thirty seconds to bring up ”‘strong and stable leadership”, the campaign slogan which has been repeated so endlessly it has become a source of ridicule for Theresa May. Arguably, the Prime Minister has refused this no soundbites request within zero seconds, her very first answer beginning with the words, “this is the most important election the country has faced in my lifetime’ itself a campaign slogan that has been repeated ad infinitum. Theresa May floundered for an answer, before again repeating her line on leadership. 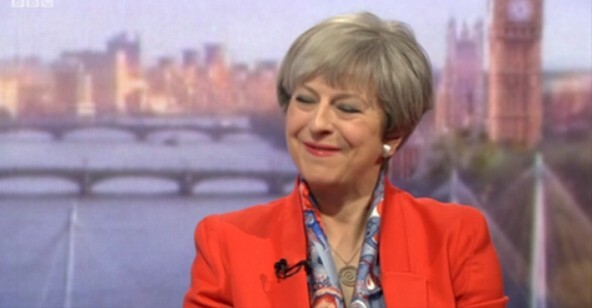 In the interview may also gave her clearest signal that she will scrap the Conservatives’ pledge not to raise certain taxes in the party’s General Election manifesto. It seems that if she talks about strong leadership, incessantly, she will embody it! As for her inability to answer direct questions directly (eg. Trident test failure) she learnt everything she knows from Tony Blair! Call-Me-Dave was as bad! Why do people vote for these people? Is there really nobody else, or can they simply not afford to stand? Maybe she THINKS if she talks about strong etc incessantly, she’ll embody it. Exactly! That is what I meant to say! Thank you! I think she gave an ultimatium for her appearance that she saw all the questions and not to give her a hard time. It was worst on scruff Pestons on Sunday interview. That Con nerd even helped her by stating that surely the Pensions triple lock could not be continued and needed revisiting ??!! He went soft on not using food bank nurses example etc……what a limp wrist interview he gave her did not see her squirm once just kept up her trade mark snide untrustworthy sortof cyanide smile. She also went back to a dangerous old Con mantra about inheriting a massive debt from Labour but Marr chose not to ask her how big that same Government debt had grown since the Cons were in the driving seat. I think Lynton Crosby likes alteration. I hear things like “strong and stable” and “chaotic coalition” traipsed out by Tories wholesale. They must have been briefed to keep repeating mantras like this mustn’t they? It’s simply to contrived to be coincidence. 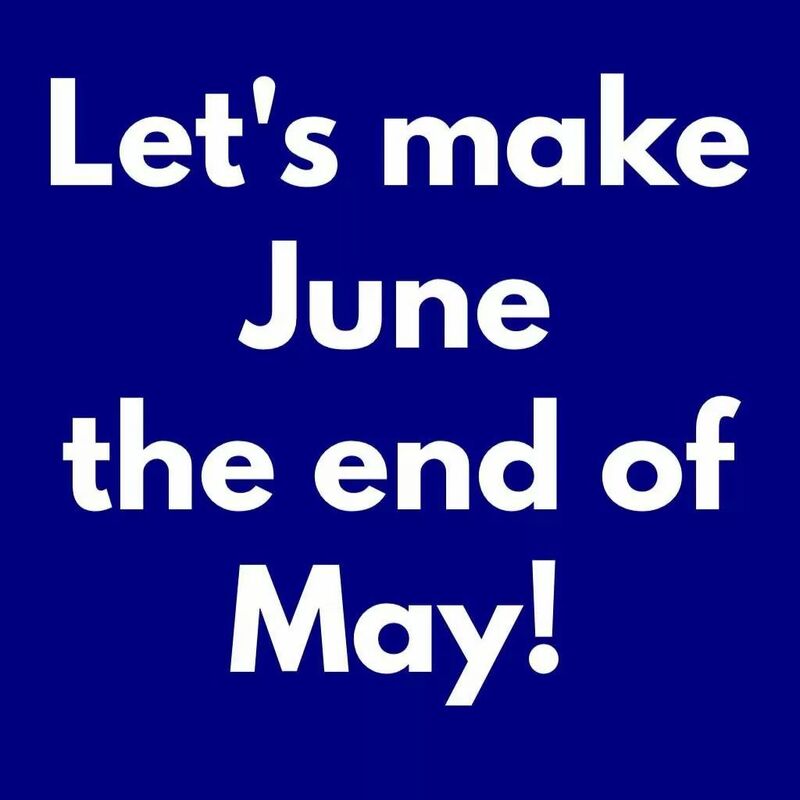 May wriggled and looked uncomfortable when Marr brought up welfare cuts, food banks and growing poverty and had no real answers. Welfare was cut, according to May, to “encourage” people into “work” which was the “best way out of poverty” and had nothing to say when Marr pointed out that many people visiting food banks were in work. Pretty bad stuff all in all but at least I can appreciate now why May wants to keep a low profile and not debate with other party leaders. The more I see of her the less impressive she seems. I wish we had better politicians and a better politics. Fear not Rose…, just announced, the mighty globalist Blair has decided to mount his white charger and save Britain from itself……he stated he could not sit idly by (counting his money?) and watch a disaster unfold before his blinkered eyes. Blair needs to join Tim Farron and just go away. Will you stop using slogans……..No answer. Do you think it is ok that nurses have had a 14% real pay cut and nurses are having to use foodbanks……No answer other than we need to build a strong and stable economy. Will the working poor have their benefits cut by a further £2500…….No answer other than we need to build a strong and stable economy. This looks awfully like a vote for tory means a vote for more austerity, do you ever think you might have got it wrong? No answer, goes on a tangent about brexit? Quoted national audit office stats at her regarding funding per pupil: says we need a fair funding system, ignores the question. Asked about no deal being better than a bad deal: She agrees this is the case. Asked about her meeting with Junker and the fact that she was described as being on a different planet and that no deal was highly likely: Rolls out strong and stable govt sound bite and that she thinks she can get a deal. Put to her that Corbyn has guaranteed EU citizens status on day 1: She refuses to give a commitment to that but says that she believes this and our citizens status abroad can be agreed quickly. Asked about fact rich people paying should pay more tax (people in houses over £5 million): She answers that Rich paying a higher percentage of tax under her govt than Labour govt did…She says taxes will be reduced for working people under tories, pushed on if that means the richest too she refuses to answer. Did you call this election because of the investigation into electoral fraud: Not the reason it was called, local money was correctly declared but they made a mistake on accounting. Should they be allowed to stand: This election is about the national interest. Corbyn on the right side on Iraq you were on the wrong side: Refuses to answer and asks who people would choose to be strong on security etc. All in all I now get why she has been hiding away, some decent questions by Marr, pushed her on a number of issues and she had literally no response and could not defend her position. The slogans are used because they have nothing else, like the fact that his first question was about Slogans as it meant she was conscious that she couldnt just rattle them off at which point she was exposed for literally having nothing.